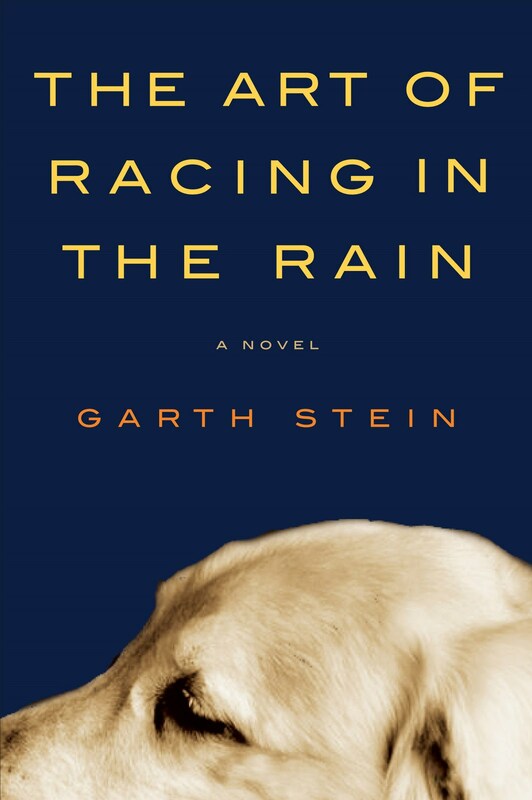 On Saturday, April 17 at 7:30 P.M. at The Writer's Center, Garth Stein, author of the NY Times bestselling novel The Art of Racing in the Rain, will read from and discuss his work. Here's an interview to whet your appetite. Bio first. 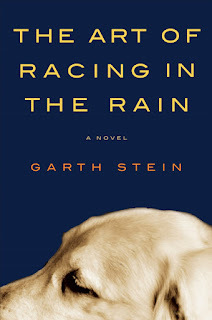 Garth Stein (from Garthstein.com) is the author of the New York Times best selling literary novel, The Art of Racing in the Rain (Harper, 2008). Now published in 23 languages, The Art of Racing in the Rain was the #1 BookSense selection for June, 2008, the Starbucks spring/summer 2008 book selection, and has been on the IndieBound™ bestseller list since its publication. Stein's previous novel, How Evan Broke His Head and Other Secrets (Soho Press, 2005) won a Pacific Northwest Booksellers Association Award, and was a BookSense Pick in both hardcover and paperback. Raven Stole the Moon (Harper, 2010) was Stein's first novel. 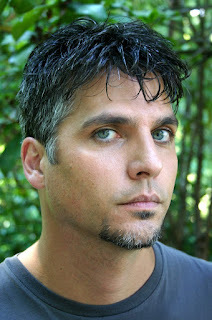 He has also written a full-length play, Brother Jones, and produced a number of award-winning documentaries. With an M.F.A. in film from Columbia University (1990), Garth worked as a documentary film maker for several years, and directed, produced, or co-produced several award winning films. Kyle Semmel: The Art of Racing in the Rain is told in the point of view of a dog. Can you tell us a little about some of the challenges you faced while writing in this point of view? Garth Stein: Well, to be perfectly honest the challenges of writing a book are extreme enough. The challenges of finding an authentic voice from any perspective. I’m not quite sure it’s any different if you’re using a narrator from an alternative viewpoint. For me, I’m not writing from a dog’s point of view. I’m writing from a character’s point of view. That character is Enzo. And Enzo is a nearly human soul trapped in a dog’s body. He’s very anxious to be reincarnated as a person, so he can do all the things he wants to do. But at the same time he’s very attached to his family and wants to stay with them. That’s the classic double bind. That’s a character who’s stuck between two worlds and doesn’t really know which way to go. So from that grows a certain amount of frustration that Enzo then takes out on his enemies non-verbally. That kind of character could be a dog, as I chose, but it could be someone else, someone who has medical issues, someone trapped in a body that won’t move, fully aware, fully awake, fully conscious yet unable to speak properly. That person is essentially Enzo. I’m not sure it was ever a dog’s point of view I was concerned about but being authentic to the character and the character’s hopes and dreams and fears and intentions and desires. KS: What should a writer be doing to make sure his or her character’s voice is authentic? Which seems like an irrelevant question, possibly. But it really isn’t, because if she had half a grapefruit and six cups of coffee she’s going to feel differently than if she had a cup of yogurt and went for a three-mile walk. In other words, she wanted to know what her character was bringing into the scene to inform how she reacts and how she acts in the scene. If you extrapolate that and say, Now, do that for every single character in your book, for every single scene, for every moment. Go back to what they had for breakfast that morning, where they came from, what they’re thinking, what is informing what is happening now. The thing we get to do in long-form fiction, which is different from what you do in drama. In theatre you’re dealing with the now; it’s the drama that’s unfolding right now in front of people. With fiction what you do is get to say, Okay, there’s the now of it, but we also get to go back as far as we want with as much depth as we want to find out what informed the now. So I think that how you build a character and stay true to the character is by understanding that you need to lay the groundwork on where that character’s coming from. Why did I pick a purple popsicle instead of an orange popsicle? And it can’t be random—oh, I just happened to pick up a purple popsicle. No, no, no. It’s because when I was a kid I once picked a purple one and my brother punched me in the head. We’re constantly making decisions based on things that happened a long time ago. For the most part we’re well-adjusted human beings. Maybe we think about it for a flash and then it’s gone. If we’re not so well adjusted I dare say—if we’re a character in a novel—we don’t just think about it in a flash; it triggers a flashback, or it triggers a phone call to our brother with whom we haven’t spoken in 20 years. Or it changes us in some way, acts as a catalyst for something. That’s why I think that, if you want to make a solid character, you need to trace back as far as you are willing to do it. KS: How much of that “tracing back,” for you, comes in revision? GS: It depends. Honestly, some people write extensive biographies of their characters. I don’t, because I have it somehow organically for the most part. But sometimes it goes wrong, and that’s when you have to go back and figure out what happened. I was talking to another writer out here a few weeks ago about revisions, and how so many people despise revisions. I despise some revisions, but love other revisions. The way I look at it is this: The first draft of anything I’m writing, I’m writing for myself. I have these ideas, I have these thoughts, and I want to tell a story. Then when I go over it I have to look at it very carefully to make sure that I didn’t betray my characters or my story in any way, so at that point when I’m revising, I’m revising for the piece, I’m revising for the characters in the story, because I have to make sure I didn’t contrive anything for my own interests. In other words, you have to be true to your characters. If you’re going to have a purple popsicle, there’s got to be reason why he picks the purple popsicle. If I’m going to say, Oh, well, one day an alien fell from the sky. Well, that’s not in the story. So I have to make it work. Then that history becomes part of the revision process, and I make sure that the initial idea I had still works with the character having evolved in the book. KS: This might be the first novel I’ve read where auto racing figures so prominently. You create such a rich metaphor with it that I have to believe that A) you’re a big racing fan, and B) you kicked around the idea of this novel for many years before you wrote it. Can you tell us about the genesis of this book? GS: I’m a fan of race car driving, but I’m not a fanatic of anything, really. As a writer, it’s good to be a fan, but I can’t go over that edge and become too deeply involved. I don’t want to write about the same thing for the rest of my life. I first got into race car driving when I was a kid. My Dad and I used to watch races on Saturday afternoons on our black and white Zenith television. It was sort of a heyday for Formula 1. Coincidentally—and this could’ve been one of the first germs of the book—we would watch the races with our dog Mugs. My father and I would have this big bowl of sunflower seeds and we’d spend two hours eating sunflower seeds and watching a Formula 1 race. Mugs would sit there with us watching the race, and I thought to myself, “How interesting that she likes watching race cars.” Well, she didn’t like watching race cars. She wanted sunflower seeds. She was waiting for us to drop something so she could eat it. For me as a five year old, I thought, this is kind of cool that she watches TV with us. That goes into hibernation for 25 years, and then I see a film. I see a film about dogs in Mongolia and how there’s a belief they get reincarnated as people. That germ takes hold and that sits for seven years. I go to a poetry reading and hear Billy Collins read a poem from the point of view of a dog in heaven, berating his master for all the things he did wrong in his lifetime. It’s a very funny poem. Then at that point I was ready to write the book. I have a dog who wants to come back as a person. I have a dog who is very judgmental about the world he sees around him. And I’ve got this idea of racing in the background, as a metaphor. At the time I started writing the book I was racing cars myself—I raced for about four years, on the amateur level, just for fun—and so it all kind of came together at the right time for me. The first draft of the book I wrote in four months. But it took me 38 years, I guess, to put all the pieces together. KS: Chapter 18 of the book is pretty much given verbatim in the video trailer for the novel. As a documentary film maker, how much role did you have in creating that short video? GS: I made it. Harper said they wanted to do a video and I said that’s great. You pay for it and I’ll make it. They said that’s great. I had this idea of using that narration and having the dog sitting in front of a television. I got great racing footage from the folks at Red Bull Racing. They were really nice to give that to me for free. I found stock footage from Mongolia, from the Mongolian mountains. And some stock music of a little Mongolian dance. Then I needed a dog. I did some casting for a dog and found one that looked like Enzo here in Seattle. We went to the studio to shoot the parts where he was staring at a television set. But the dog was absolutely a horrible actor. He couldn’t sit still, couldn’t focus. It was just a disaster. Then I thought, Well, there’s only one dog I know—though she doesn’t look like Enzo—who would stare at a television for two weeks if I put a cookie under it. That’s my dog, Comet, and that’s how Comet got cast in the trailer. We shot it and watched it and decided it needed a little more, some family. So I got out my old 16mm film camera and went to the park with a friend of mine, her daughter, and Comet, and we shot the scenes where Comet is running around in the park. Kind of like a home movie style. We’re introduced to Eve and Zoë and then that was it. We put it together and that was the video. Videos are interesting ideas for marketing a book. They’re kind of antithetical to the whole idea of a book, which is that when you read you create your own images in your head. Yet here we are with videos putting images into people’s heads. Does it greatly affect the marketing of a book? It can. I’m sure it can. There’s some that are really good. They’re getting much better, now that some people are getting savvy to the world of putting together these videos. Two or three years ago I don’t think they were nearly as good as they are now. KS: How has the success of The Art of Racing in the Rain changed you as a writer? GS: It’s a good question that’s a little difficult to answer because there are a few layers to it. It’s certainly freed me up to spend all my time writing. But I can’t spend all my time writing. I have to spend a lot of my time continuing to do promotion and marketing for The Art of Racing in the Rain. It’s my obligation. My job as a writer is not just to write a book and leave it be. My job is to make sure people read the book. So the ongoing marketing is very important for a writer to follow through on. At the same time, I do have to write my next book. It’s a very tricky balance. In terms of time, generally writers—at least from my experience—sequester themselves in the world of their book and don’t come up for air until it’s finished. I don’t get to do that. In terms of managing expectations of readers, I don’t know what to say about that except that I have to write what I feel is my next book. I have to make sure that it’s true to what I want to say, and I have to make sure that it’s true to my feelings. And if it is, then I think it will be good enough and people will love it. When I teach workshops I say to people, You have to feel the joy of the writing process and you have to feel it to your very essence while you’re writing, because, if you don’t—if you’re writing for another reason—the reader will see through that and know that it’s not from the heart and is not genuine. Race car driver, Kevin York, is Stein's good friend and the real-life inspiration for the character of Denny Swift. It is an amazing story that is told mainly from the point of view of a dog named Enzo. While this sounds far fetched, it truly works and does not come across as contrived in any manner.